Poets are not afraid of Eternity. Each of them has their own one. The element of water is eternity for the Ukrainian-American poet Yurii Lazirko. This year the author, who is well-known in the poetical spaces of the Internet, has published his first book of poems. 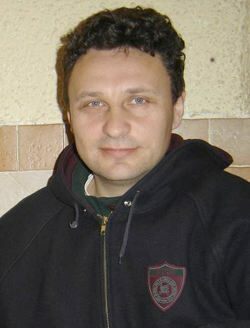 Yurii Lazirko was born in 1967 in Lviv. He studied in the Lviv Polytechnic University and then once went to see his uncle in the US and stayed there in order to pursue his studies in America. He graduated from the William Paterson University with a diploma of a computer scientist. Lazirko is as yet little known in Ukraine. This interview is actually the first bridge between Ukrainians and the author. After all, it is important to know about the new wave of Ukrainian diaspora literature. A new star has lit up in the pleiad of Ukrainian poets, coming to the world of lyrics from the world of accuracy and mathematical discussion. Your first book, Krapli Vsesvitu (Drops of the Universe), was published by Ternopil’s Aston Publishing House. What did you want to say through your poems? Did the book come easy to you? “But for the Internet, my poems probably would never see the light of day. I have intentionally included some of my early works in the book in order to demonstrate the abyss of time dividing my exercises in poetry as a student and the awakening of my soul today. The language was dying in me. This is a lengthy process, but it seemed to be inevitable under the circumstances. “There are two ways to exist within another country’s society: to integrate deliberately into the society and take an active part in its public and professional circles or to stay in a ghetto language environment, limiting yourself to constant thinking about the past time and unhappy destiny. Everyone has to make his own choice. However, it would be ideal to follow Shevchenko’s words and learn foreign culture, while at the same time keeping your own. “Nearly 18 years in a foreign land, the process of getting on my feet (obtaining an American diploma and experience in your field. By the way, here lies an interesting paradox: if you have no experience, you won’t find a job, and vice versa, and it is difficult to break out of this circle), and the sociolinguistic environment were changing my worldview with each passing year. My profession is far from literary criticism: I am a professional computer scientist, working to create various business integration applications. “The Internet was an impetus to my awakening. It brought communication with creative people, common interests, and a creative-informational space in which I felt involvement in a common cause: bringing aesthetic and spiritual pleasure and receiving it from the desire to share my words with others. By 2005 there was no contemporary Ukrainian literature for me, neither was there poet Lazirko. Probably somewhere deep inside, on the subconscious level, there was a desire to share poetry, and so it has happened — my first book has been published. Your poems are often full of sad and melancholic echoes. Where does this melancholy come from? “Melancholy is a well-balanced state of soul; it is meditation, rather than despair or anger. Ukrainian soul is fairly susceptible to this state. Take our folk-songs — a good deal of them are filled with this substance. I have recently started writing songs — it’s the same equilibrium of sadness and joy. “Sadness is, perhaps, dreams that you don’t understand, better understanding of images and deeper penetration into them, prescience of certain processes that man cannot or doesn’t want to control. And in general I like balance in everything. Why do you refer so frequently to the past? “The past is a herbarium of our future. Time is a relative notion. Now we have it and then we lack it. It runs, creeps, leaps, comes, and becomes empty. In the dimensions of the Universe this is, in contrast to the fleeting moment of life, a spiral where events take place in cycles — a perpetual sequence of births and deaths. What does memory mean for you? Do you manage to follow the development the Ukrainian literary process? If so, what is your opinion on contemporary Ukrainian poetry? How would you characterize this process? “Contemporary Ukrainian literature has recently revived — in my perception. In my opinion, our literature is in the state of creative search at the moment. For sure, there are many talents, and I will keep myself from listing them. But a talent is only part of understanding oneself. The development [of Ukrainian literature] is being partially hindered by the state’s language policy. In the sphere of book publishing Ukraine cannot match its northern neighbor, Russia, in any of the categories. This is the area where our statesmen should show wisdom. But I believe that time will put everything in place and we will have our day, too. “As a poet, I am interested in the development of modernism and postmodernism, as well as the signs of growing comic literature (satire, mannerism, and ironical humor), because this style is underdeveloped and underrepresented. The style of humoreska (a short comic story), like the works of Pavlo Hlazovy and Ostap Vyshnia, has been imprinted on my memory since I was a child. But I may be not sufficiently informed.